Bramble and Fischer’s new book reaffirms that the ethics of eating meat is still a hot matter. Indeed, many things food-philosophical still are. The book contains twelve essays with a short introduction from the editors. Some of the essays are orthodox. Some of them are heterodox. Even the most orthodox, familiar pieces are full of striking insights and ideas for new directions. It contains sharp, riveting asides about anti-natalism, bug-eating, comparative accounts of harm, duties to pets and prey animals, and so on. Kenya’s nyama world aside, Bramble and Fischer’s book raises important arguments about food production. Although, admittedly, there is comparatively little in the book about eating as opposed to buying or producing food. Indeed, with the exception of Belshaw's and Callicott's papers all of the other papers in the book are critical of contemporary meat production. That said, interesting questions have been raised, for instance, how do we generate conclusions about consumption based on the raising and killing of animals? Donald Bruckner’s questions goes further: If certain arguments generate the conclusion that it is wrong to eat farmed animals, do they also generate the conclusion that it is wrong to eat animals’ period? Do such arguments get quite a bit further than a requirement not to eat certain sorts of animals? Do they get as far as a requirement not to eat certain sorts of vegetables, namely, those produced using methods that kill animals or destroy animal habitat or are produced in ways that are environmentally destructive, he wonders. Ronald Elly Wanda is the Executive Director of Grundtvig Africa House, Nairobi, Kenya. 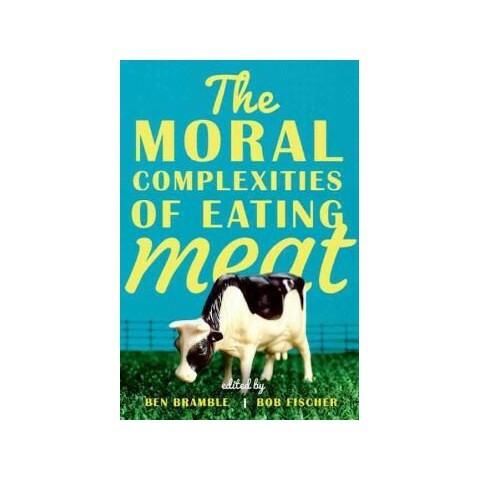 The Moral Complexities of Eating Meat, (2016) Ben Bramble and Bob Fischer (eds. ), Oxford University Press, 217pp. $29.95 (hbk), ISBN 9780199353903.